GiveWell has published our annual update on how to accomplish as much good as possible with your donations. Our top two charities – out of hundreds we’ve examined – are (1) the Against Malaria Foundation, which fights malaria using insecticide-treated bednets, and (2) the Schistosomiasis Control Initiative, which treats children for intestinal worms. We have published the full details of our process, including a list of all charities examined and reviews for those examined in-depth. Our top two charities are outstanding on all fronts. They execute proven, cost-effective programs for helping people. They have strong track records. They have concrete future plans and room for more funding. They are transparent and accountable to donors. We also have identified five other standout organizations for donors interested in other causes. These are GiveDirectly (cash grants to poor households in Kenya), Innovations for Poverty Action (research on how to fight poverty and promote development), Nyaya Health (healthcare in rural Nepal), Pratham (primary education in India), and Small Enterprise Foundation (microfinance in South Africa). Note that last year’s top-rated charity, VillageReach, does not have projected short-term funding needs (it expects to be able to meet these needs with funds not driven by GiveWell), as discussed previously. The charities above all work in the developing world. Our top recommendation for donors who want to support causes in the United States is KIPP Houston, an outstanding charter schools facing budget cuts. Over the last year, we drove over $1.6 million to our top-rated charities. We hope to drive substantially more over the coming year. > Note that last year’s top-rated charity, VillageReach, does not have projected short-term funding needs (it expects to be able to meet these needs with funds not driven by GiveWell), as discussed previously. Does VillageReach agree with this assessment or is this GiveWell speaking? Gwern, it is GiveWell speaking based on our room for more funding analysis, but we ran this post by VillageReach before posting it and got approval for the language we used. Note that VillageReach does still have significant funding needs and there is no guarantee that it will meet these needs. GiveWell folks, thanks for all your research! I’m excited to give money to the newly recommend charities, knowing that they have a good chance of doing good. And I’m especially intrigued to see how the work of the new charity GiveDirectly fares over time. Part of me worries that they are missing out on the scaling effects that one can get from e.g. large distributions of malarial nets, but part of me likes the idea of recognizing that poor individuals should be trusted to make the best choices for what their needs are. AMF should consider updating its website. It’s so awful I reflexively distrusted it, despite my considerable respect for GiveWell’s opinion. Of course my response was irrational given the set of prior beliefs I had. But as long as a decent number of people are similarly biased and respect GiveWell’s opinion less than I do, I think there’s a good chance the resources spent to clean up the website would help AMF raise even more money. Sam- We agree with you. The website will be made simpler and clearer and this is overdue. A couple of questions on AMF. If they are not (as I understand from your post) distributing the nets themselves, but rather making in-kind grants to other nonprofits to carry out the distribution I assume there is significant variance in capacity amongst those groups (some being massive international NGOs, some being tiny local community or faith based groups). Does AMF provide any capacity building to those lower-capacity groups that may be working in remote, difficult to reach malaria-endemic areas to ensure their potential for results is maximized? Aside from photos of nets hanging in homes (which personally I don’t find very compelling) does AMF require these recipients carry out any kind of longitudinal evaluation to determine a) whether nets are being used consistently and correctly and b) whether malaria incidence or mortality is decreasing in those areas? Obviously you can’t draw a straight causal line from net usage to decline in morbidity and mortality as there are so many other factors in malaria incidence and endemicity. Nonetheless, it would be interesting to know whether the nets are being used and whether they are contributing to improved health outcomes. My second question is about other malaria prevention interventions. 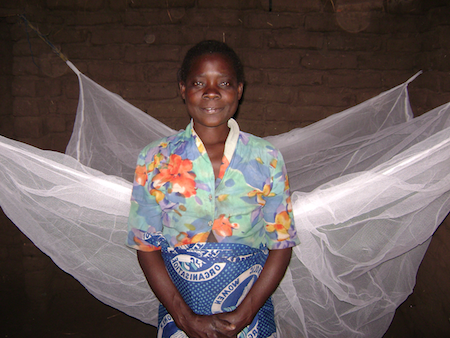 Given what we know about the various vector species that carry malaria parasites, we know that simply providing and sleeping under nets is insufficient to prevent transmission. Many of the vector species are crepuscular rather than nocturnal–so they are most active at times when people aren’t likely to be in bed. Moreover, some of them are exophagic–i.e. they take their meals outdoors. When AMF selects its local partners for net distribution does it take these factors into account? Do the local partners also engage in other interventions to address the threat of endophilic/exophagic species and crepuscular ones? Does AMF take this information into account when selecting its partners? For example, if they have two proposals from partners in Equatorial Guinea would they consider the fact that one organization also links to or engages in IRS, home improvement (window screens), source reduction or IPT for pregnant women? You are correct we do not distribute nets ourselves but work with distribution partners who have the capability to do so. You are also correct there is significant variation in ‘capacity’ of these distribution partners, where capacity here means the size of distribution they can successfully handle. For example, Concern Universal in Malawi is very able to handle a 250,000 net distribution, whereas other partners would not be able to do so but are very capable of handling a 5-10,000 net distribution in the area in which they work. We assess all distribution partners to ensure they have the ability to conduct a successful distribution, of course. We do not specifically help build the ‘capacity’ of individual groups, where here capacity means either or both of scale (more staff to cover a larger area for example) and additional resources (more motorbikes; more equipment so they can cover more health interventions in a particular area for example) as that would take us into a very different area of responsibility for which we are not equipped and would remove our focus from ensuring distribution programmes are run successfully. However we do work with partners and help them in their approach to a net distribution and to some degree that could be argued to be capacity building in this second meaning. For example, in Mali we worked with a group called Project Muso to distribute 22,500 nets in an area called Yirimadjo. For us to be involved in a distribution here we required a pre-distribution registration survey (PDRS) to be completed which would assess the number of sleeping spaces and the number of perfectly usable long-lasting insecticidal nets (LLINs) on a household by household basis. This led to Project Restore seeking and achieving support to allow this capacity/ability to be built, albeit with funding not from us. I would argue this has left Project Muso in a better position to manage malaria control work in their area. We do require each distribution partner to provide data on continued net use. First, an immediate Post-Distribution Report (PDR) provides us with feedback on how the distribution went, including what went well and if anything, what did not. Frequently this will include a report on the immediate post-distribution follow-up carried out typically within two weeks of the distribution to assess net hang-up and use. If this immediate net hang-up assessment does not show very high levels of net hang-up (less than 95% is our guidance, but we do not ask for data in a systematic way), the distribution partner will liaise with local leaders and health workers and initiate hang-up actions to ensure very high levels are achieved. Second, we require a series of Post-Distribution Surveys (PDSs) to be carried out at 6, 18, 30 and 42 months post distribution to assess continued net use and the condition of the nets. This is not a scientifically, statistically significant survey however but it does focus partners’ attention on sustained net use and monitoring of it and provides meaningful information that can lead to action if necessary. We require 50 households to be visited in each distribution sublocation, which will typically have 1,000-2,000 households within it. A form is required to be filled in for each household and we receive all forms and make public the data collected. We also gather malaria case data where possible. It is not always easy as the records in some parts of Africa are, shall we say, challenging. Where there are obviously high rates of malaria, indicated by a combination of blood slide parasitology tests, mortality data, research studies, malaria-mapping data and a general consensus of where malaria is a key health issue, we will not necessarily let a lack of malaria case rate data prevent our support for a distribution. Increasingly however, we require this data as we wish to be able to make a pre- and post distribution comparison of malaria rates. A further challenge can be the existence of ‘good’ malaria case rate data, ie monthly numbers for malaria illness stretching back many months, but gathered on a clinical basis, ie diagnosis by observation of symptoms, rather than through diagnostic testing (blood analysis). The data may be comparable from month to month but can be very unreliable. Introducing blood slide testing yields better data but the comparison with the pre-distribution period may be compromised or lost as you are measuring something different. Our default position here is to work with partners to introduce blood slide testing as this gives better data. We are now starting to gather data and it shows malaria goes down as nets go up, and it goes down most when the nets continue to be used. We are looking at how best to group and publish that data. There are many anecdotal stories from our distributions to the effect ‘malaria doesn’t exist here anymore’ (I receive numerous emails and reports with very similar wording) but data is what we are after. The most active malaria-carrying mosquito is the Anopheles Gambiae, and the pregnant female, the most significant vector, is a night-feeder and bites typically between 10pm and 2am. If the pregnant female does not get a blood meal every 10-12 days she cannot reproduce. Hence universal coverage of nets can have a dramatic impact on the malaria-carrying mosquito population and malaria case rates. You ask if we consider a potential distribution partner’s other activities eg IRS. Not directly, no, as we focus on their ability to carry out a successful net distribution. However, part of that assessment will look at their activity and resources in that region and their ability to carry out Pre-Distribution Registration Surveys and Pos-Distribution Surveys, for example. Strong distribution partner candidates will often be involved in other health interventions in the area, such as IPT, so indirectly these elements do bear on our decisions. This is particularly true in larger scale distributions which are becoming more common for us. Great initiatives – I wish there would be more of them in the world, they are very important for all of us. I fully agree that charities should bear the burden of proof for the impact they are making. However, that requires additional resources to be spent on carrying out the necessary evaluation activities. AMF now requires their distribution partners to carry out such evaluation. I was wondering if you could give a rough estimate of how much is spent on evaluation (the pre- and post-distribution surveys). I just found the answer to my question further down in the report. Thanks for the transparency!